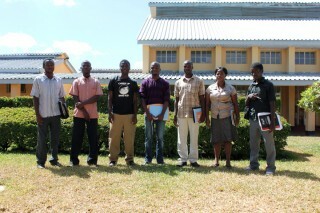 Teaching Malawian students how to build small scale wind turbines. Jeroen Bomers is living in Malosa, Malawi. 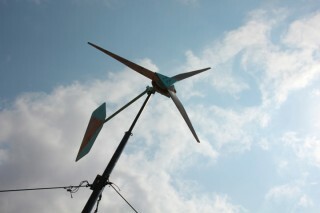 He has successfully build a 2.4 m diameter wind turbine based on the open-source design of Hugh Piggott. It is now spinning in his backyard. He was interested to see if it was possible to build a wind turbine from local available materials.After building and running this wind turbine for about 4 months he was convinced that this technology could benefit also other locals and decided to devote his time and effort to teach other locals how to make and operate such a wind turbine. Jeroen started with his next step: Teaching Malawian students how to built and use small scale wind turbines. In April Jeroen started teaching 22 students at Mikolongwe DAPP Vocational School in Chiradzulu how to build small scale wind turbines. They plan to build a 3 m diameter Hugh Piggott version. The course will be given in the coming two months as a pilot project. After this period hopefully building wind turbines will be part of daily life at Mikolongwe. The first wind turbine manufactured by the students is going to be placed at Chiuta Entrepreneurial Training Village in Luchenza. This is a village where orphans from the Luchenza orphanage will be living after their secondary school. They will be given technical and entrepeneurial training so they can start their own small businesses. The DAPP technical school from Mikolongwe will help them with that. The plans are to set up a training program in which we can teach these young Malawians to set up profitable businesses making wind energy.